please help me! :-) I have a big-big problem. I see this node at you: Add Shared Parameter to Project. This is very usefull but I’d like add type parameter to an existing family. But nowhere on internet I can’t abel to find any info about this how can be done it. Would you please send me an solution how can I add type (or instance) parameter to an family? Yeah, that’s fine with me. Thanks for sharing! I wonder if anyone could help, struggling to populate titleblock parameters via dynamo. 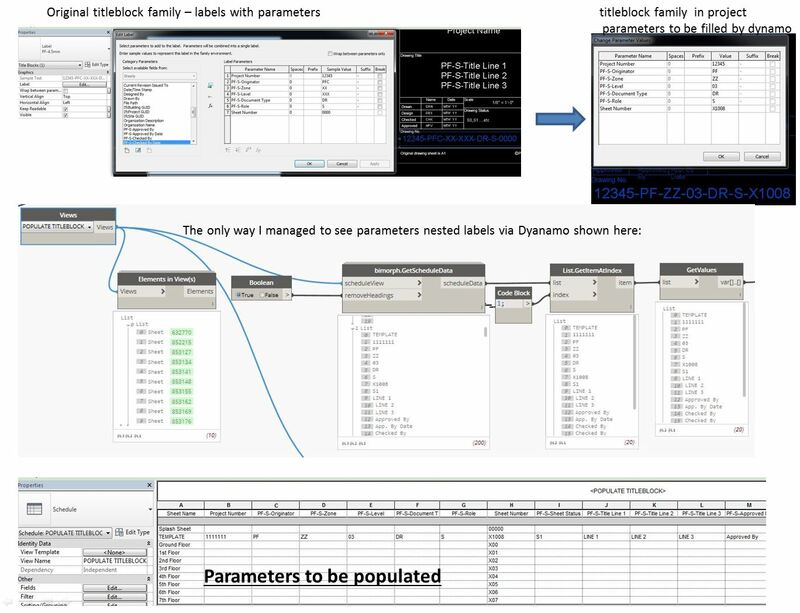 1)	Titileblock family which has Label family that carries parameters, those were populated in project via assigning new shared to sheets. 2)	When I try to get these parameters on Dynamo to be populated I cannot find a way of doing so. It seems that the reason is they are nested label parameters. What you are collecting are Sheets not Titleblocks. Try collecting all Titleblocks and then looking up their parameters. I’m trying to find your node GetDocuments and can’t seem to place it in the library. Can you point me in the right direction to find it please. It should be under Selection. I have been using your warnings parser workflow for some time now. I just had to update it to Revit 2019 and I am receiving an error in the identical instance portion of the script. In addition, it does not seem like you can link the report to the pdf option to print. I think this issue is only prevalent in 2019 as i have not had problems in 2017 & 2018 other then versioning. I can send the script over if youd like to have a look. Hi. Can you do me a favor, and create a sample model + dyn definition and post a link where I can download it from. The best place to post that to would be https://github.com/ksobon/archilab/issues I can track any issues pertaining to archi-lab.net package there much easier. Thanks!